Using the Global Ecological Land Units map and the data behind it, scientists, planners, conservationists, and the public can access information about the environment using a common framework, a common language, and a common spatial unit. In December 2014, Roger Sayre of the US Geological Survey (USGS) and Esri unveiled a whole new way to classify, organize, and see the world: the Global Ecological Lanåd Units (Global ELU) map. The map and underlying data (provided as layers) are available from ArcGIS Online and provide new knowledge of geographic patterns and relationships, presenting a better platform for science and a useful accounting framework for conservationists, resource managers, and land planners. The Global ELU map divides the land surface of the planet into 62,500-square-meter squares. 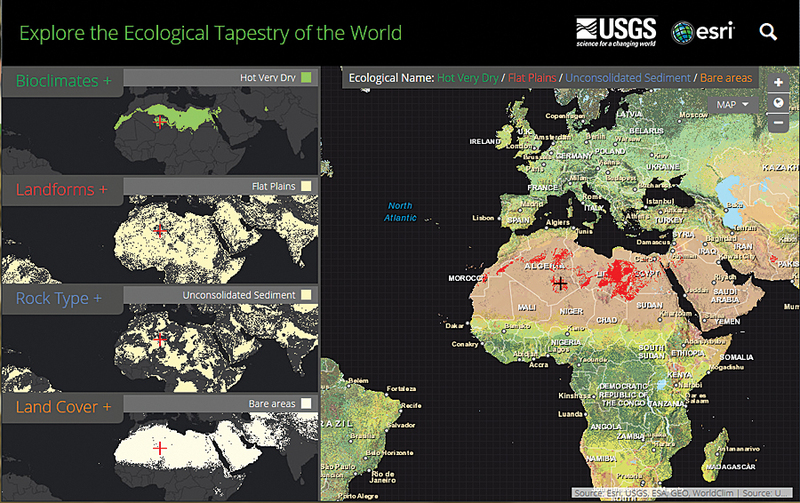 The map tells the story of each square in terms of land cover, landform, climate and surface rock type. With the Global ELU map and the data behind it, scientists, planners, conservationists, and the public can access information about the environment using a common framework, a common language, and a common spatial unit. "The global ELU map advances an objective, repeatable, big-data approach to the synthesis and classification of ecologically important data layers into distinctive and meaningful georeferenced land units," said Sayre, senior scientist for ecosystems at the USGS Land Change Science Program. 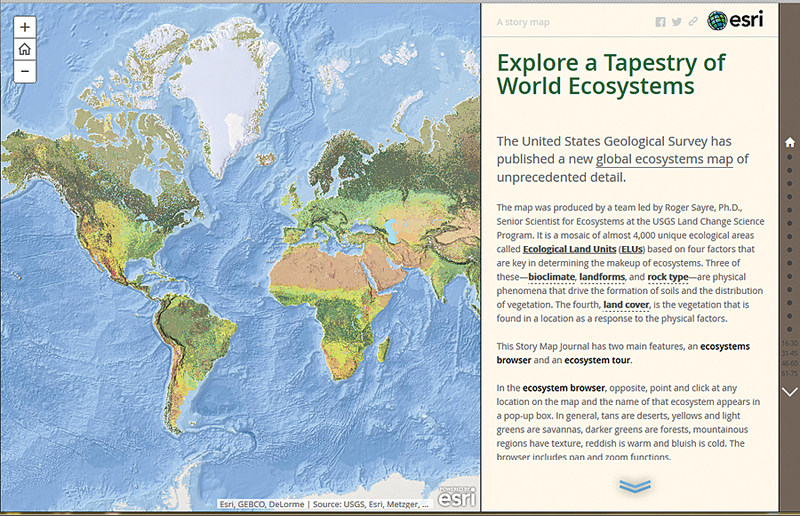 This story map introduces ecological land units and lets you explore more than 100 places of high diversity. Data in the map for some regions was already available. The difference is that the Global ELU uses four environmentally important data layers to describe each 250-by-250-meter square of land using common terms. Three of the characteristics—landform, climate, and rock type (or lithology)—influence the fourth characteristic, land cover. ELUs are a blending of the classifications of these four elements. For instance, Warm Dry Hills on Metamorphic Rock with Sparse Vegetation or Cool Moist Plains on Carbonate Sedimentary Rock with Mostly Deciduous Forest are classifications familiar to middle and high school science students so ELUs can be understood by a broad audience. And for the first time, those terms are comparable anywhere on the planet. Without a common language for reference, it can be difficult or impossible to develop understanding at a global scale. "Take energy usage. Now, the conversation is difficult because everyone uses their own terms," noted Peter Aniello of Esri, who is a member of the team that developed the Global ELU map. What one country calls a mountain might be a hill somewhere else. ELUs still don't provide the entire picture. ELUs are medium scale. They fill a gap between fine-grained and macro views. While they do not include the complexity of biotic, species-level information, they do include physical and biological elements that drive the conditions that make it possible for a species to exist and thrive. "The ELUs lend themselves to the study of ecological diversity, rarity, and evolutionary isolation," said Randy Vaughan, another team member from Esri Professional Services. "For example, we can identify the most diverse landscape in terms of ELU composition or we can search for the rare or isolated ELU instances for further study. Understanding diversity can point the way to conservation and preservation planning." In December 2014, the American Association of Geographers published the peer-reviewed paper, A New Map of Global Ecological Land Units: An Ecophysiographic Stratification Approach, which describes the methodology employed in the creation of Global Ecological Land Units. The foundation for the Global ELUs is publicly available data already shared by scientists and governments around the world. The team that created the Global ELU map is a public-private partnership that considers this effort an example that illustrated the value of open data. To create ELUs, Esri and the USGS began in 2013 by building a GIS of the world using a 250-by-250-meter grid that contains 3.5 billion cells. Each grid included all four elements that comprise an ELU as well as data from many other datasets. A collection of historical maps was used to validate and corroborate this data. The USGS and Esri vetted each of the input datasets, ensuring each was the best available at the time, and evaluated each to understand the data quality. After canvassing the globe and describing it in terms of the four different data layers, Sayre and the team came up with 47,500 distinct categories that they called "ecological facets." Since there were too many categories to represent on a map, these facets were compressed further into 3,923 ELUs. The classifications of the source data were reduced to the simplest—yet still ecologically meaningful—set of groupings by summarizing or simplifying the underlying attributes. Work to make better use of advanced spatial and statistical analysis, GIS processing, cloud computing, and geographic science to produce a single dataset of ELUs is ongoing. After compiling the Global ELU map, the team analyzed it to see what it revealed. The initial findings showed where the planet's most ecologically diverse regions are located. The most diverse region was found in east-central California, about 300 miles northwest of Las Vegas in the Sweetwater Mountains. The Ecological Tapestry of the World online explorer application lets you look at the ecological data behind the Global ELU map. 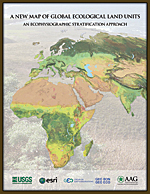 In December 2014, the American Association of Geographers (AAG) published the peer-reviewed paper titled A New Map of Global Ecological Land Units: An Ecophysiographic Stratification Approach. Sayre was its primary author. Also in December, US Interior Secretary Sally Jewell introduced the new Global ELUs at a Washington, DC, conference of professionals, researchers, and policy makers involved with ecosystem services known as ACES: A Community on Ecosystem Services. In addition—to help expose the Global ELUs to a broad audience—the team engaged Esri Professional Services to create the Ecological Tapestry of the World web application and the Esri Story Map team to create the story map Explore a Tapestry of World Ecosystems. The team behind the creation of the Global ELU map is asking users to exploit this new platform for global, physical, and ecological science, planning, and management and provide feedback. Climate change impact assessments, conservation planning and priority setting, and assessments of the economic and social value of ecosystem goods and services are among the many potential applications. The team also anticipates that analyses done with the ELUs will change as the data behind them is updated. "Users of ELU data may help by documenting deficiencies in the current layers and suggesting improvements to the data structures to facilitate synthesis and analysis," Sayre said. Both the map and data layers are available on an open database for use in any GIS effort. The team is already planning to go further with the new GIS of the world, which they consider to be a platform for better environmental understanding and management. "The approach used to aggregate and classify data may also be used for other endeavors such as human geography or ocean science," Vaughan said. "We are in the early stages of investigating what combinations of human and cultural data might be usefully combined." For more information, contact Roger Sayre or Randy Vaughan.